Archive of 2005 PNC Info. 12/31/05 - The January 2003 issue of Coil Line is now online in the 'Reference' section. 12/29/05 - Several new entries have been added to the PNC Glossary. Descriptions and links for 'Bridge', 'Stick' and 'Tie' are now in the Glossary, which is in the Reference section. I have received an unconfirmed report of plate V33332 on the (10�) Atlas from Gary Wolf. 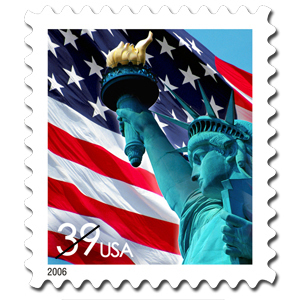 12/28/05 - The image for the Water Activated (39�) nondenominated Lady Liberty and U. S. Flag coil stamp from Sennett Security (SSP) has been posted. 12/21/05 - George Spyrou sent in his cover with the Atlas V32332 for confirmation and scanning. The new number has been added to the affected pages. Click on the scan for an enlarged view. 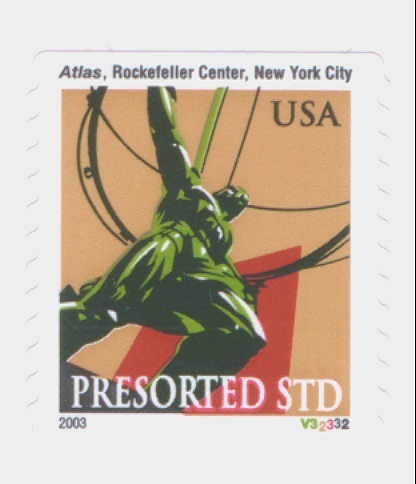 12/20/05 - The (39�) PSA Lady Liberty & U. S. Flag stamp from Ashton Potter has been posted on the data page. 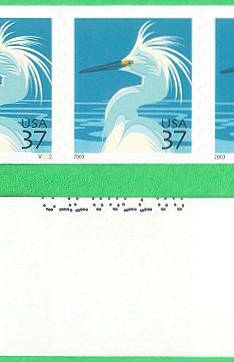 This printing, as had been the case with Ashton Potter printings of the 37� Snowy Egret may exhibit a 'seam line' in the right margin of the stamp to the left of the plate numbered stamp. 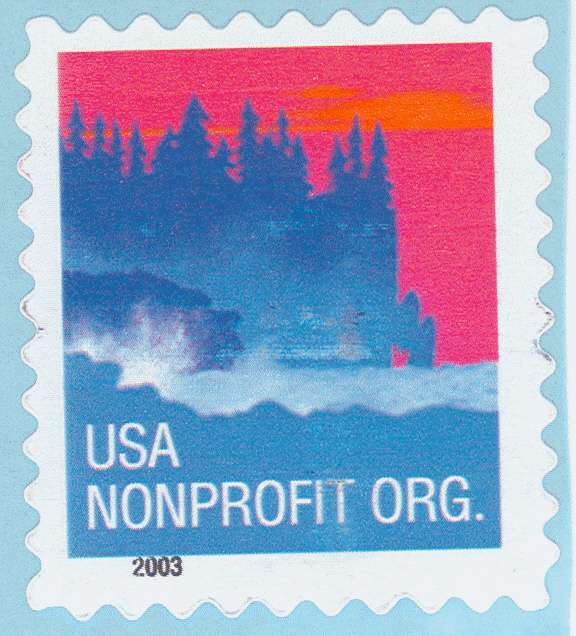 The stamps also include a micro-printed "USPS". Click on the image to see a larger version showing the 'seam line' and the location of the micro-printing. 12/15/05 - Donna Rajotte in Providence reports that she has the (39�) PSA Sennett Security coil of 100, plate number S1111 every 14 stamps. Donna notes that they all seem to be P/V.� USPS item number 783000. Donna also has the water-activated sheet of 100 and the AP 2� Navajo jewelry pane of 20. 12/14/05 - Scott Publishing Company has assigned catalog numbers to 3 of the 4 Lady Liberty coils. Scott # 3967 goes to the Water-Activated coil of 3000. # 3968 is assigned to the Avery Dennison version and the Ashton Potter printing gets # 3970. Scott mentioned that they have reserved a number (presumably 3969) for a stamp that they had not received before their deadline, which probably is the Sennett 'stick' coil. All the affected pages have been updated, plus I've added a scan on the Avery Dennison Lady Liberty stamp. Renate Fearonce in Tucson sends word that she has received the Seacoast P7777, with top back numbers, interval of 27 and that the inner core is all gone. She also now has the water-activated Lady Liberty sheet of 100. 12/13/05 - Carl Wicklund wrote to let us know that he found a new Atlas number, V13222, on cover. I have received an unconfirmed report of another new Atlas number found on cover, V32332, from George Spyrou. 12/12/05 - Technical details known so far are posted for the (39�) nondenominated Lady Liberty and U. S. Flag coils of 100 from Avery Dennison and Ashton Potter. No scans are available yet. 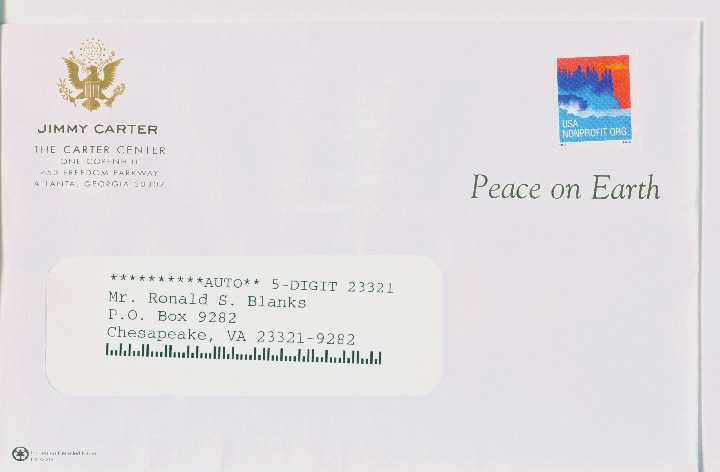 12/11/05 - Ronald Blanks supplied the on-cover scan on the left of the (5�) nondenominated Ashton Potter Sea Coast coil stamp with plate combination P6666 which he received in the mail on December 6. Click here for a look at the cover. 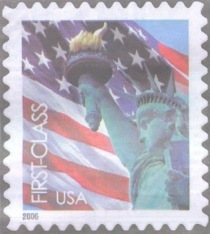 Michael Mules supplied the USPS publicity photo on the right of the 39� Lady Liberty and U. S. Flag stamp. 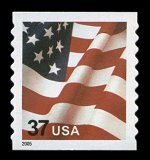 The Postal Service is accepting pre-orders for the Denominated 39� Flag PSA Roll of 10K which will be released on January 8, 2006. 12/10/05 - Technical details known so far are posted for the (39�) nondenominated Lady Liberty and U. S. Flag coils of 100 and 3000 from Sennett Security. 12/9/05 - Justin Dreiseszun called in to report that he found a cover franked with a (5�) nondenominated Ashton Potter Sea Coast coil stamp with plate combination P6666. I hope to have a scan sometime next week. 12/8/05 - The Sennett Security 'stick' format Self Adhesive coil of 100 with the new 39� rate has arrived. This was the only coil format available at my post office today. Renate Fearonce in Tucson sent word that she has received the balance of the rate change stamps except for the water activated sheet of 100. 12/5/05 - The results of our PNC3 auction #33 which ended November 19, 2005 are now posted online. All the auction information can be accessed by using the 'Membership' button, or by clicking here. Thanks to Auctioneer Joe Sedivy for another successful auction. 12/2/05 - As a result of an inquiry from Tom Hamilton, we have posted a page showing the Squared and Rounded SHOULDER die cuts. I plan to expand the page with known plate numbers. There is a link from the Glossary in the Reference section and Comparison pages in the PNC Data section. The new rate change coils will go on sale December 8, 2005. Reported so far are a nondenominated Lady Liberty and Flag PSA coil of 100, with plate number V1111 every 11 stamps and a nondenominated Lady Liberty and Flag WAG coil of 3K, with plate number S1111 every 14 stamps and pink 4 digit top and bottom back numbers every 10 stamps. 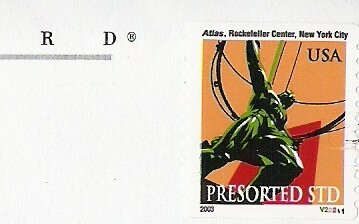 Both stamps are dated 2006. Bob Rabinowitz adds: "I've learned that thus far the Sennett and Avery Dennison coils of 100, the Sennett coils of 3,000, and the vending convertible and booklets show no other plate numbers but all 1s. Likewise for the ATM. The Avery-Dennison production shows the usual V/P and P/V along with mesas, cobras, etc. I've also learned that Kansas City is expecting an Ashton-Potter coil of 100 but whether this is denominated or non-denominated is not clear." Donna Rajotte in Providence reports that she has several of the rate change items in stock. Renate Fearonce in Tucson reports that she just received more of the .37 Flag coil of 100, PSA, 2002 date, 3333A, with plate number every 24. 12/1/05 - The December 2002 issue of Coil Line is now online in the 'Reference' section. 11/23/05 - Mike Lipson forwarded an email from Ray Kusmierski that included the Atlas V33333 scan shown on the right. Ray states that the stamp came from a handful of stamps that his grand-daughter cut from her mail and sent to him. All of the affected pages have been updated with the new number first reported by Mike a month ago. Click on the scan for a larger view. 11/17/05 - One of the planned rate change items is a 'Lady Liberty' nondenominated stamp to be issued in coils of 100 and other formats. 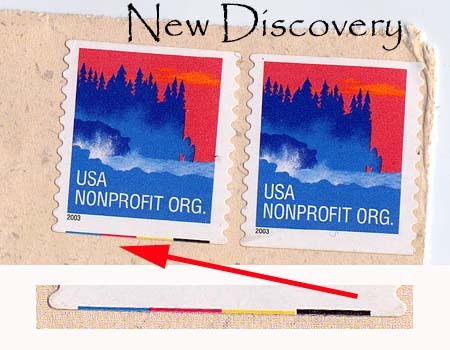 The scan on the right came from a Linn's Stamp News article by Jay Bigalke. 11/9/05 - Rob Loeffler, a member of the PNC3 Washington-2006 committee has provided an update on the status of plans for the international show next year in Washington, DC. Click here for the update. Bob Hubsmith is the PNC3 Chairman. 11/8/05 - Donna Rajotte in Providence reports that she has a die-cut variety, valley/peak, on the 37� Flag PSA coil of 100 with plate S3333 (14 stamps for a plate strip)� USPS item number 780100. Todd L. Johnson sends a scan of a (5�) Sea Coast coil stamp from Ashton Potter with the '2003' date shifted to the right but without a plate number on the stamp. Todd says that "I believe from the amount of the shift there should exist some PNCs with number 222P (or 333P) with the black 2 (or 3) on the end being shifted off the edge of the stamp." Jeffre Fiszbein subsequently sent in the scan (far right) of a plate numbered stamp he bought a couple of years ago. Click on Todd's scan for a larger view. With the help of Conrad Keydel, the data on coil sizes on several stamps has been updated. The stamps are: Scott # 2225 (1� Omnibus), # 2603 (10� Eagle & Shield), # 3208A (25� Diner), # 3229 (10� Green Bicycle), # 3280 (33� City Flag) and # 3770 (10� Atlas). 11/7/05 - A scan has been added to the 29� Blue Eagle data page showing the reverse liner printing. 11/4/05 - Rob Washburn reports that he has 2 covers showing the colored bars @ bottom on the 5 cent Seacoast SA 2003 like the 10/26 report of Dave Cockrill, but can't tell if Dave's is the WA version. Rob also would like to announce that his PNC cover price list #39 will be available next week. Anyone wanting one should send him a 37cent SASE. Rob Washburn, PO Box 840, Skowhegan ME 04976. 11/1/05 - The November 2002 issue of Coil Line is now online in the 'Reference' section. 10/26/05 - Dave Cockrill reports that "While processing a huge mixture of modern precancel coils I found a 5 cent SeaCoast Coil with distinct CYMK Bars (kinda like the old partial plate number). This must be at the bottom of a cylinder. I have not seen this previously in over 60,000 SeaCoast coils. Since I had no idea if this was listed or reported. I put it on eBay starting at One Cent. �� Has anyone else seen this one or have anymore info about its circumstance." 10/25/05 - Auction Director Joe Sedivy has the lots for PNC3 Auction #33 posted. The auction ends November 19 and you must be a member to bid. Click for a 'Word' or 'Works' file and here for the bid form, or go to the 'Membership' tab for this or past auctions and/or to join the club. Joe asks that you please include your email on your bids. 10/20/05 - Bob Rabinowitz is reporting plate P7777 on the (5�) Sea Coast and Mike Lipson forwards a report of plate V33333 on the (10�)Atlas found on cover from 'a very reliable source'. 10/14/05 - Donna Rajotte in Providence reports that she has a new number, V23113 on the 10� Atlas. The plate number and back number both repeat every 10 stamps, with the blue 5 digit back number 4 to the right of the plate number. Donna states that she also has a few other items that just came in. 10/10/05 - Scott Publishing Company has assigned catalog number 3759 to the 3� Silver Coffeepot coil. 10/8/05 - Jewell Meyer reports that 2 coils of 3,000 of the (10�)Atlas with plate V22211 were available from the Los Angeles Postal Service at the LAX SESCAL show. The back numbers are 3 stamps to the right of the plate number and the appearance tends to be different on both coils. 10/1/05 - The October 2002 issue of Coil Line is now online in the 'Reference' section. 9/28/05 - Alan Thomson advises that the Coil Line was mailed today. Renate Fearonce in Tucson notes that she finally received the 3c Silver Coffeepot coil. It's plate S1111, interval 14, top and bottom pink numbers, position 2/4 or 1R and 1L. 9/26/05 - Alan Thomson sent word that he will be mailing the October issue of Coil Line on Saturday, October 1. 9/24/05 - Scans of the 3� Silver Coffeepot stamp are now posted. 9/23/05 - Alan Thomson sent a 'heads-up' that the October issue of Coil Line might be a little later than normal this month because he is on jury duty, and other complications. I hope to have an update when I get word. 9/22/05 - Technical details for the 3� Silver Coffeepot coil of 10,000 are now posted. 9/5/05 - Ric Levett in Providence reports that he has the (5�) Sea Coast PSA coil of 10K Ashton Potter printing with die cuts on two sides only, plate number P5555 every 27 stamps, top and bottom back numbers every 10 stamps, 270 stamps for all positions. USPS item number is #781400. 9/4/05 - LABEL MANIA, a newsletter for Collectors of U. S. Coil Labels, was published by David E. B.-LaVergne of Boston, Massachusetts from January, 1989 to August, 1990 and consisted of three issues. Through the courtesy of Conrad Keydel, we present photocopies of the three issues. The link is also in the 'Reference' section. 9/3/05 - On the advice of Alan Thomson, I contacted Bob Murrin about the "Egret V2131" mentioned below on August 12th. Bob agreed to send the stamp for examination. Today I took a good look at it under an 'Ott' light and strong magnification. I also compared it to other Egrets that I had.� The dark blue '3' bothered me,�especially the way it was formed,�and I concentrated on that number.� The '3' was not like any other of the 3s on other Egrets, in that it seemed to have a 'tail' which extended below the bottom of all the other numbers. My conclusion is that it is not a 3.� The 'tail' is black in color and appears to be part of the cancellation.� A closer look reveals that the third number, hidden under the cancel, is actually a dark blue 1, so that the plate number is V2111, not V2131. I am sending the stamp to Alan for his perusal. I'll make corrections to the database if necessary after I receive his opinion. Alan concurred with my opinion and all references to the Egret V2131 in the databases have been removed. 9/1/05 - The September 2002 issue of Coil Line is now online in the 'Reference' section. 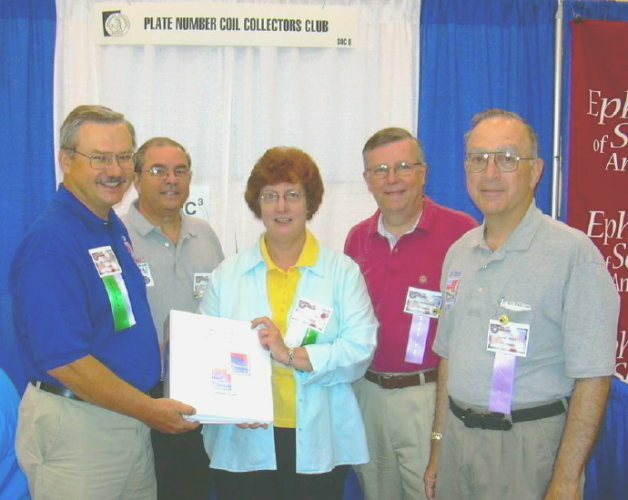 8/13/05 - Frank Covey, President of the Plate Number Coil Collectors Club (PNC3), presents a copy of the PNC3 catalog to Gini Horn, Librarian of the American Philatelic Research Library at the PNC3 booth during the 2005 APS Stampshow in Grand Rapids, Michigan. Pictured from left to right are Frank Covey, President, Gene Trinks, Past President, Gini Horn, Tom McFarland, Secretary and Andy Jakes, Treasurer. Click on the photo for a larger view. Frank, Gene and Andy are members of the Catalog Committee along with Ron Maifeld, who was at the show but not available for the photo. 8/12/05 - Scott Publishing Company assigned catalog number 3633B to the Ashton Potter 37� U.S. Flag reprint coil of 100. The 37� U. S. Flag Comparison Page has been updated with the new number. Scott also assigned numbers 3792a to 3801b to the 2005 PSA (25�) nondenominated American Eagle Presorted First-Class Mail stamps. The strip of 10 is 3801c. Bob Murrin found another new Snowy Egret number, V2131 in a mixture. The number is hard to read because of the cancel, but Bob says that it has a yellow 2 and a blue 3. 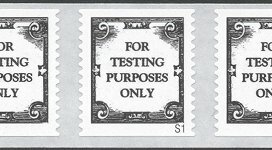 Click on the scan for a larger view of the whole stamp. 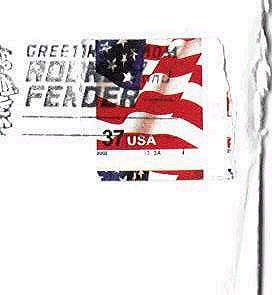 Dan Farrar found a cover with Atlas V22211 on 8/11.�The return address is American Express, Ft. Lauderdale, Florida. Click on the scan for a larger view. Ric Levett in Providence reports that he has the 37� PSA Egret coil from Ashton Potter with plate number P44444 every 31 stamps. 8/11/05 - We have posted a Consignment Page for the next club auction. PNC3 Auctioneer Joe Sedivy has announced that he will accept auction items until September 17th. Click on the link above and print out as many sheets as you need. The page is in Acrobat 'pdf' format. The page will also appear in the September issue of Coil Line. 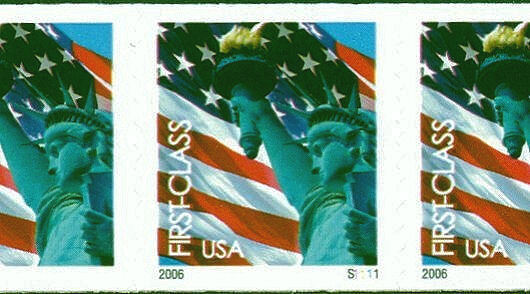 8/9/05 - Scans of the (25�) nondenominated American Eagle Presorted First-Class Mail stamp are now posted. (10�) NYC Public Library Lion PSA coil of 10K, plate number S66666 every 20 stamps, pink 5-digit middle back numbers every 10 stamps, 20 stamps for�position 5 only, �2000� date.� Just a different (middle) back number location. 37� PSA Egret coil from Ashton Potter. PSA coil of 100 stamps, plate number P55555 with the plate number every 31 stamps. Renate Fearonce in Tucson notes that she also has the (25�) American Eagle PSA coil of 3K, with plate number S1111111 every 20 stamps. Back numbers are pink and she has top / bottom / middle back numbers every 10 stamps. There are three differences between the old 10K coil and the new 3K coil of the (25�) American Eagle. The year date is 2005, the back numbers are four digits and there is no black line on the reverse of the liner. 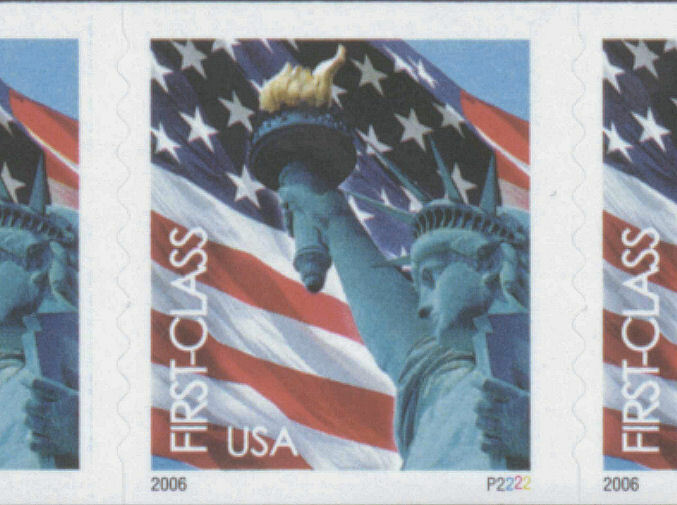 8/1/05 - What information I have available on the (25�) nondenominated American Eagle Presorted First-Class Mail stamps is posted. I'll update the page when I return from the APS Stampshow in Grand Rapids. Ric Levett in Providence reports that he has plate V21211 on the (10�) Atlas. Ric notes that the back number is on the third stamp to the right of the plate numbered stamp, in the middle. 7/31/05 - I have re-examined my copies of the Ashton Potter 37� Snowy Egret coil and found Seam Lines on plates P33333, P44444 and P55555. I wasn't sure, but Doug Iams has confirmed that now all plate numbers have been reported with seam lines. 7/30/05 - The August 2002 issue of Coil Line is now online in the 'Reference' section. 7/29/05 - Ric Levett in Providence reports that he has a new number, plate S66666 on the (10�) New York City Lion. 7/26/05 - PNC dealer Jim Nelson to accumulate information on PNC Untagged Errors for future inclusion in the PNC Values List.� PNC dealer Jim Nelson has agreed to try to assemble the needed data from all members of PNC3 and others in regards to Untagged Errors occurring in PNC's. If you have any untagged errors in your collection; either mint strips or used singles, please contact Jim Nelson at 5649 E 100 N,� Kendallville, IN. 46755-9670 by mail, telephone 260-897-3975, or by e-mail at jnelsonpncs@rexnet.net.�� Jim needs to know the stamp, plate number, whether a mint strip or a used single.� He also needs to know if the error is on "Hi-Brite" paper if you are able to check with a Long Wave UV lamp. In addition, he needs to know the price that you paid for it, if you can remember.� As soon as this data can be compiled, it will be included in the next PNC Values listing. PNC3 Auctioneer Joe Sedivy has announced that he is accepting auction items until September 17th for the next club auction, # 33. Lots can be mailed to Joe Sedivy at P.O. Box 410602, Chicago, IL 60641-0602. For more information, contact Joe at PNC3Auctions@aol.com. 7/25/05 - Mike Lipson reports that he has found two seam line varieties on the 2005 Ashton Potter 37� Flag with plate P1111. The first has a faint seam line to the left of the vertical die cuts. The second has a faint seam line to the right of the die cuts with a dominating cap, which he calls the fence post. Click here to see the scan with the varieties. Doug Iams also found seam lines: "The faint one I found exactly matches the second one Mike mentions including the "cap" (I didn't know how to describe it, but Mike's picture shows it well). I got a second roll and it has a constant plate variety (at least constant though this roll) of an obvious red dot 6 stamps right of the numbered stamp touching the left side of the 2nd red stripe (counting from the bottom).� In the seam line department, it only has 2 short red vertical dashes near the bottom of the right margin of the stamp left of the numbered stamp." Renate Fearonce in Tucson notes that she has the 37� Ashton Potter PSA Flag coil of 100 with plate number P1111 every 31 stamps and 2005 date, and the centering looks good. 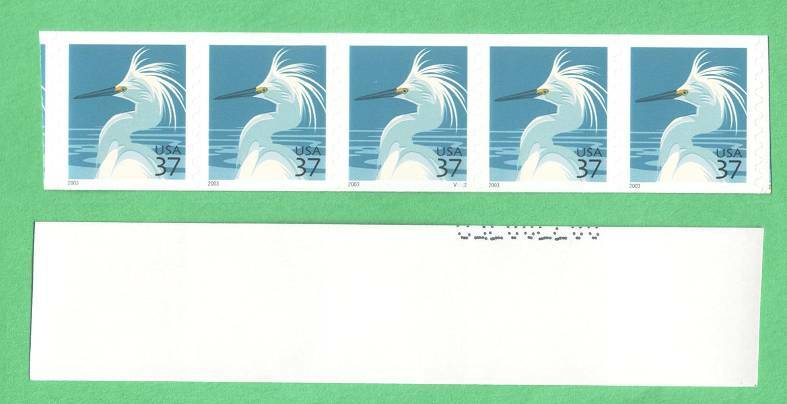 Ric Levett in Providence reports that he has the 37� PSA Egret coil of 100 from Avery Dennison with plate number V3212 every 11 stamps. USPS item number -782200. 7/19/05 - Bob Murrin sent the attached scan of a new Egret plate number, V2121, and on the same scan a picture of a constant plate variety, which he has dubbed the 'Lightning Blue Egret'. The color difference is quite striking (pun intended). Bob says the V2121 came from a mixture. Click on the scan for an enlarged view. The 37� U. S. Flag Comparison Page has been updated with the new Ashton Potter printing. 7/17/05 - Bob Murrin, a PNC dealer and a PNC3 Life Member has been added to the Member Dealers Page which can be accessed through the 'Collecting PNCs' menu bar on the left. 7/16/05 - Ric Levett in Providence reports that he has the 37� BEP Flag coil of 100 with plate 6666A. I received my replacement order of the Ashton Potter 37� U.S. Flag reprint from Kansas City in the mail yesterday. Click on the scan for a detailed image. The data page has been updated with the new information. 7/13/05 - Several collectors have reported receiving their copies of the Ashton Potter 37� U.S. Flag reprint from Kansas City. The plate number is P1111 and the repeat frequency is every 31 stamps. Craig Selig sent the attached scan. 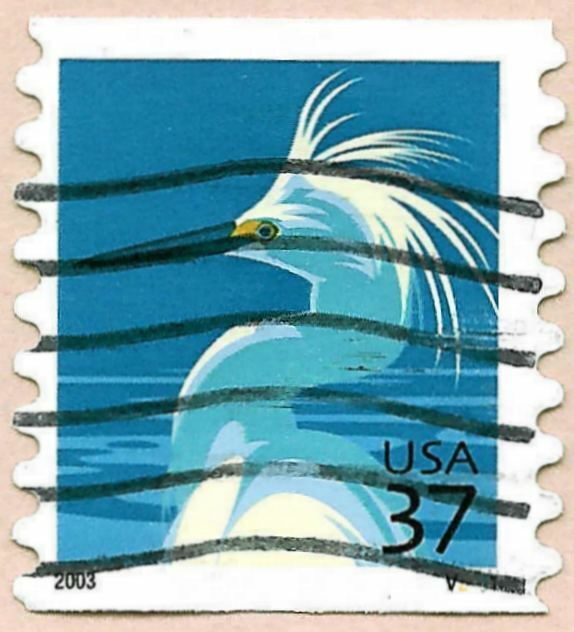 Craig said that the coils came individually shrink-wrapped like the Ashton-Potter snowy egret coils, and the stamps appear to be on pre-phosphored paper, adding that they do not appear to be overall-tagged. Click on the scan for a larger view that shows the '2005' date and the black, micro-printed "USA" in the top red stripe. 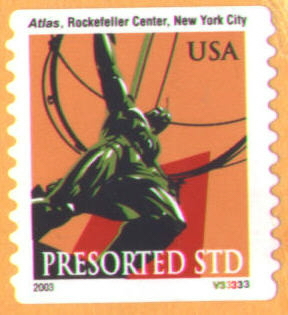 Steve Esrati adds that the stamp was printed by offset lithography. Ric Levett in Providence reports that he has them in stock. 37� PSA Flag coil of 100 with �2005� date from Ashton Potter.� Plate number P1111 every 31 stamps.� USPS item number � 780100. 7/5/05 - I spoke with a Customer Service representative at Stamp Fulfillment Services in Kansas City this morning about the Ashton Potter 37� U.S. Flag reprint mix-up and she said they had some internal problems and that everything 'should' be straightened out now. The correct item is in their computers, and we should be getting the correct coils. I also explained to her how to tell the difference between the Ashton Potter coil and the BEP version. 7/4/05 - The Sea Coast comparison page has been updated to show the small and large dates on the Ashton Potter printing. A data page has been added for the Ashton Potter 37� U.S. Flag reprint. Some of the data is still tentative. 7/2/05 - Jewell Meyer reported and I can confirm with receipt of my order that Stamp Fulfillment Services in Kansas City is shipping the wrong item concerning the article below dated 6/23/05 posted by John Cropper. Although we both ordered Item # 780143 which was listed in the Postal Bulletin, Jewell and I both received the BEP 2002 printing with plate 4444A, which has an item # of 780140. A call to 1-800-STAMP24 failed to resolve the problem. I'll call Customer Service on Tuesday and see what they say. 6/30/05 - The July 2002 issue of Coil Line is now online in the 'Reference' section. 6/22/05 - I'm happy to report that I found the missing link today. Coils of 100 of the 37� Snowy Egret with plate P44444 were found in a supermarket while searching for more P5s. The search is frustrating and time consuming because each coil has to be opened and verified unless the number can be seen on the outside of the unopened coil. So far as I know, the P4s and P5s have only been found in supermarkets, and as might be imagined, there is some resistance to letting a customer open and check coils. 6/13/05 - Maurice Bessette in Oneco, CT sent a note that his email address has changed to: MAURICE.A.BESSETTE@USPS.GOV. Maurice says that he now has the BEP Flag coil with plate 5555A in stock. Rick Levett, Donna Rajotte's summer replacement in Providence, RI, has the following in stock: (.05) Sea Coast PSA coil of 10k Ashton Potter printing with die cuts on two sides only, plate number P4444 every 27 stamps, top and bottom back numbers every 10 stamps, 270 stamps for all positions. Rick says that these seem to be the same as the P3333. Renate Fearonce in Tucson has the 3� Conestoga Wagon (48), 3k coil, with shiny gum and plate #6 back in stock. 6/08/05 - Jim Nelson sent a note that he has two more new lists available, for a total of 4. See note from 5/30 below. Click on the 'Collecting PNCs / Member Dealers' bar for more information. 6/04/05 - Another new plate number, P55555, has surfaced on the 37� Snowy Egret coil of 100. There have been no reports of P44444 as of yet. 6/03/05 - A new plate number, P4444 on the 5� Sea Coast, has been reported by Mike Lipson. According to Mike the stamps with P4444 appear the same as those with P3333 and should be assigned the same Scott number, 3874a. Doug Iams reports that plate 6666A exists on the 37� BEP Flag coil of 100. 5/30/05 - The June 2002 issue of Coil Line is now online in the 'Reference' section. Jim Nelson sent a note that he has two new lists available.� "The first is titled "Odds & Ends; CPV's" and is a four page pricelist available for a large # 10 37� SASE.� The other is a 38 page Back Number Inventory List of every back number that I have in stock by catalog number, plate number, strip size, how many back number digits, color, position, etc.� It is not a price sheet.� Most prices are and/or will be on my next price sheet.� This BN Inventory is available for $2.50 refundable on the first order over $25.00.� This is hand written on our late friend John's sheets which allow for I believe, 17 listings on each page.� It was fun assembling !!!!!!!!!" Click on the 'Collecting PNCs / Member Dealers' bar for contact information. 5/23/05 - Jim Kloetzel, editor of the Scott Catalogue, confirms that the new number, 3874a, assigned to the (5�) Sea Coast stamp is for Plate P3333, which has a smaller date (1.7+ mm), as opposed to the P2222 which measures about 2.1 mm. The 'larger' date also appears to be bolder and taller as seen in the scan supplied by Zeb Vance. 5/16/05 - Lowell Handberg sent a scan of a (10�) Atlas with plate combination V21211. I'm showing the colors of the scan just as I received it. Lowell apparently was having problems with his scanner and the red and orange came out as blue. He sent another with the correct colors. 5/13/05 - The results of our PNC3 auction #32 which ended April 23, 2005 are now posted online. All the auction information can be accessed by using the 'Membership' button, or by clicking here. Thanks to Auctioneer Joe Sedivy for another successful auction. 5/10/05 - Scott Publishing Company assigned number 3874a to a "(5�) Sea Coast coil, serpentine die cut 10 vert., with small date." Steve Esrati theorizes that the new number is for "the stamps with the plate-number combination P3333, which does have a less bold date, but not a smaller one. P2222 has the same die cut, but a bolder date." 5/4/05 - Renate Fearonce in Tucson confirms that she has the 37� Flag PSA coil of 100 with plate number 5555A every 24 stamps. 4/30/05 - The May 2002 issue of Coil Line is now online in the 'Reference' section. 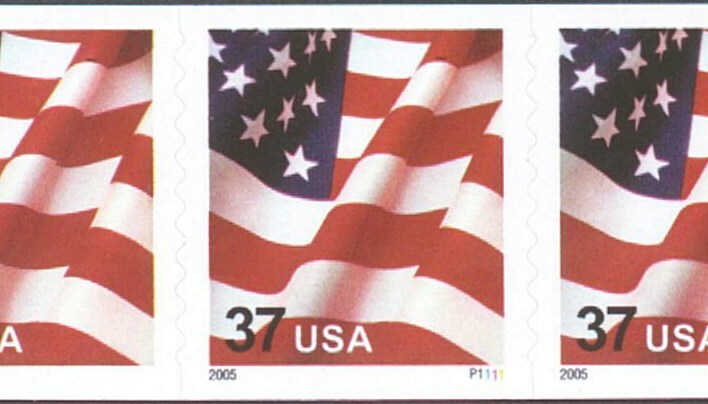 4/26/05 - Donna Rajotte in Providence has the 37� Flag PSA coil of 100, with plate number 5555A every 24 stamps.� USPS item number-780100. 4/19/05 - Tom McFarland caught the fact that I had not updated the Coil Line links on the Classic Links page for a while. It's now current. Victor Collinino found a previously unreported plate number on a postally used copy of the 37� Snowy Egret while searching a used mixture recently. The new number is V3221. 4/13/05 - Robert Rabinowitz sent a scan of the BEP 37� U. S. Flag with plate 5555A. Bob notes that the numbers have returned to the original order of colors found on 1111 through 9999. As you may recall, the 1111A-4444A had a different order. In addition, the suffix A in the 5555A is quite a bit smaller than previous A's. 4/11/05 - In regard to the item immediately below from 4/10/05, Mike Lipson reports that the report of V3233 with an upside down control number may be in error. Bob Rabinowitz responds that the information below is wrong. The number V3233 had been reported to another dealer with the control number information. It now turns out that the original finder had reported it to this dealer incorrectly. The correct number, with the control number on the back, is V3222. This report comes from the same source that Lipson's came from. The report of plate V3233 is bogus and the number does not exist. Mike sent a scan of a partial 9 digit control number on the back of a strip of 5 with plate # V3222, which is illustrated above. Click on the scan for an enlarged view. Additional details of the find have been, or will be, submitted to�Coil Line in an article by Doug Iams. 4/10/05 - Robert Rabinowitz is reporting a new plate number, V3233 on the 37� Egret coil of 100. Bob also says that, in addition, this number has the upside down 9 digit control number that we saw on the 21� Bison V11 from the same manufacturer. Thanks to Victor Kuil who found a bad link that we missed in the switch to our new server. 3/31/05 - The April 2002 issue of Coil Line is now online in the 'Reference' section. The Postal Service has released information on the 3� Coffeepot gummed coil of 10,000 to be issued September 16, 2005. Click on the link above for the info. 3/30/05 - Robert Rabinowitz is reporting that the BEP has issued plate 5555A on the 37� U.S. Flag PSA coil of 100. 3/27/05 - Auction Director Joe Sedivy has the lots for PNC3 Auction #32 posted. The auction ends April 23 and you must be a member to bid. Click for a 'Word' or 'Works' file and here for the bid form, or go to the 'Membership' tab for this or past auctions and/or to join the club. Joe asks that you please include your email on your bids. Doug Iams reports on the US Stamp Group - "I just received a group of Sennett self-adhesive Lions on loan that the owner found to be tagged. The S55555s had the strongest tagging - still very light, at the same level of the Sennett self-adhesive Seacoasts I have seen. The S11111s, S33333s and S44444s were extremely lightly tagged." 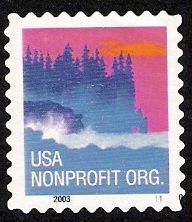 The US Stamps Group can be found at http://groups.yahoo.com/group/usstamps/, and is now included in the 'Online Resources' bar. Robert Rabinowitz reported earlier "There are confirmed reports of tagging on both the (5�) Sennett self-adhesive Sea Coast (S1111 with 2004 date) and their (10�) Lions. ���� I've examined my Lions and found very light tagging on S77777 strips with # on #. The strips that didn't have # on # came from different rolls and showed NO very light tagging. I also found similar light tagging on all of my S11111s. The tagging is on the white borders and not within the stamp. I haven't completed my examination of all numbers and positions I have on the Lions. I also have learned and confirmed that Sennett 37� Flag rolls of 100 S4444 now also comes with smooth tagging." Don Mackintosh found an error in our listing of the 1� Omnibus, Scott #2225c. The 'c' listing should show an imperf variety. An email from Steve Esrati prompted me to check the Scott listing on the 12� Stanley Steamer and I found that they have plates 1 and 2 listed for the Untagged Error, Scott 2132c. Donna Rajotte in Providence announces that she has a new number, S4444, on the Sennett Security 37� U.S. Flag PSA coil of 100. Plate number is every 14 stamps and has Uneven Tagging. Conrad Keydel found a couple more non-working links left over from the server switch. 3/20/05 - A new 'Test Coil' printed by Sennett Security Products was discovered recently. The stamps are self-adhesive and untagged. The die cuts measure 11.5. More information as it becomes available. Click on the above link or access the Coil Test Page using the 'Reference' section. 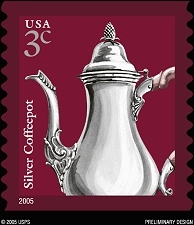 3/19/05 - An article in the March 28, 2005 issue of Linns mentions that a 3� water-activated coil stamp depicting a silver coffee pot is scheduled to be issued at the Milcopex stamp show to be held September 16-18 in Milwaukee. Several sources indicate that a reprint of the (25�) American Eagle coil with 10 designs will be issued August 5th at the APS Stampshow in Grand Rapids, possibly with a 2005 year date. Ken Martin of the APS says he has been told that the format will be PSA coils of 3000. 3/18/05 - Rob Washburn wants to announce that his latest pnc covers pricelist will be available on 3/22 and if anyone wants one, please send a SASE. Click on the link and then scroll down to find Rob's information. Doug Iams writes on the 'US Stamps Group' that the Sennett self-adhesive Eagle and Lion coils exist lightly tagged like the Sennett self-adhesive Seacoast. Dan Metlay and Chris Landa both wrote that some images on the Eagle and Shield comparison page were not loading. That's been corrected. 3/17/05 - A new 'Test Coil', printed by Sennett Security with plate S1 has been found. More details and a scan as I get the information. Thanks to Kerry Kuball who found another bad link that was missed in the switch to our new server. 3/12/05 - Gary Wulfsberg sent in a scan of a cover he received which appears to be a 'die cutting missing' (Imperf) and miscut U.S. Flag with plate 3333A. 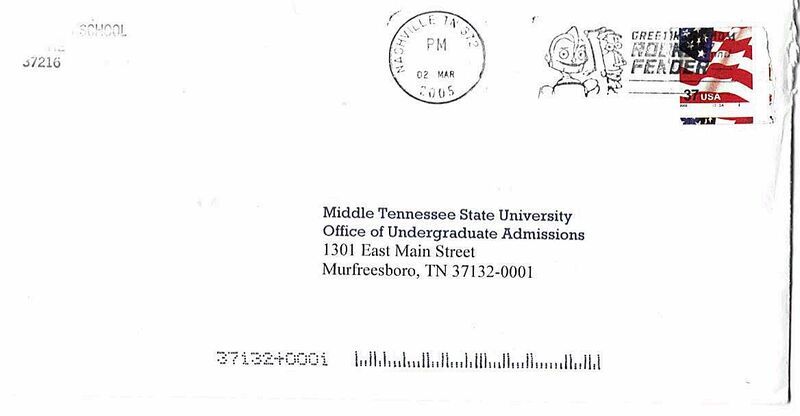 Click here to view the cover which includes part of the return address, which was mailed from a school in zip code 37216. Click on the stamp on the right to see a blow-up. 3/7/05 - Thanks to Arthur Westneat who found a few links that were missed in the switch to our new server. 3/1/05 - The March 2002 issue of Coil Line is now online in the 'Reference' section. Donna Rajotte in Providence announces that she has a new number, 4444A, on the 37� BEP U.S. Flag coil of 100, and a supply of the Snowy Egret with P33333. 2/28/05 - Chris Landa found another new number on the 37� Snowy Egret PSA coil of 100. Pictured to the right is a scan of the new find, V3211. All affected lists have been updated. Justin Dreiseszun sent a scan of the (10�) Atlas with plate combination V11222 that he found on a piece of bulk business mail and which was reported here on January 27, 2005. 2/27/05 - Renate Fearonce reports that she has a couple newer items to Tucson. They are: 23� George Washington coil of 100, V24, plate number every 11, and 37� Flag coil of 100 (stick format), S4444 every 14 stamps. 2/22/05 - John here. To improve the site performance, I've moved booklets to their OWN web: booklets.pnc3.org . This will allow faster authoring and loading of both sites and allow for faster back-ups. 2/16/05 - Donna Rajotte in Providence announces that she has a new number in stock on the Ashton Potter (5�) Seacoast stamp. Donna writes - "(.05) Sea Coast PSA coil of 10k Ashton Potter printing with die cuts on two sides only, plate number P3333 every 27 stamps, top and bottom back numbers every 10 stamps, 270 stamps for all positions. 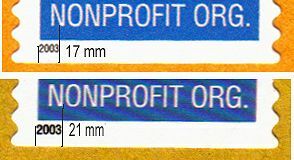 These seem to be the same as the P2222 except the 2003 date is smaller and the colors seem sharper- especially the white writing on the stamp (USA NONPROFIT ORG.)" Bruce Menia reports that he received a 'Souvenir Page', (now named American Commemorative Cancellations by the USPS), which has the (10�) Atlas with plate V12222 tied to the page with a 13 SEP, 2004 cancellation. The spreadsheet for Souvenir Pages, in the 'PNC Data Bar', has been updated with the new information. 2/14/05 - Renate Fearonce in Tucson sent a copy of her latest inventory while the site was down and here it is. 1/31/05 - The February 2002 issue of Coil Line is now online in the 'Reference' section. 1/27/05 - Justin Dreiseszun called to inform me that he found the (10�) Atlas with plate combination V11222 on a piece of bulk business mail. No scan is available at this time. 1/24/05 - Robert Rabinowitz reports that the date on plate S77777 of the (10�) NYC Library Lion is back to the year 2000. The repeat is every 20 making finding # on # a 1 in 10 shot. 1/22/05 - Robert Rabinowitz is reporting plate S77777 on the (10�) NYC Library Lion coil. No word on the S66666 yet. Smooth (Solid) Tagging - Plates S1111, S2222 and S3333. One person reports that S3333 has a glow to it under Longwave-UV. Uneven Tagging - Plate S1111 - Not known if glow exists at this time. Plate S3333 is known with no glow, an orange glow and a bright orange glow under LW-UV. Plate S4444 is know with an orange glow. The data page has been updated with the above information. Additional reports are welcome. 1/16/05 - 'Yes Virginia, there is a...umm - V12111.' Jeff Fiszbein and Herb Holmes both sent in scans of their used singles and Carl Wicklund, the source of the original report added that he has a couple used singles. 1/15/05 - I received an email today questioning the existence of plate # V12111 on the (10�) Atlas. We originally ran the story of the find on 14 July 2004, with credit to Carl Wicklund, without a scan. Jeff Fiszbein just wrote to say that he has a used single that he found in a mixture. I've asked Jeff to send a scan. Stay tuned. 1/14/05 - A number that probably doesn't mean much to anyone except a webmaster is the counter near the bottom of the page. On December 27, 2003, a year and a couple of weeks ago, we reached the 100,000 visitor mark. Today we recorded visitor number 150,000. It took over 6 years to reach the first milestone and it appears that we might reach 200,000 in two years time. Thanks to everyone for their continued support and encouragement. 1/13/05 - The data page for the 37� Sennett 'Stick' U.S. Flag has been updated with input from Michael Mules, Jeffre Fiszbein, Frank Covey and Robert Rabinowitz. Both S3333 and S4444 are confirmed with Uneven Tagging using Short-wave UV light and have Red Stripes on the Flag that glow either Orange or a Bright Orange under Longwave UV light. The stripes are dead on Solid Tagged stamps when viewed under UV light. 1/12/05 - In a reversal of a previous announcement, Jim Kloetzel, Editor of the Scott Catalogues announced that the catalog number (3785a) assigned to the prephosphored 2003 Ashton Potter Sea Coast stamps with serpentine die cuts on all four sides, has been changed to 3785b. The 3785a number is now for the reprinted Sea Coast with 9.35 x 10.1 (9� x 10) die cuts and Plate P2222. Scott #3785 is for the original Sea Coast with 9.45 x 10.1 (9� x 10) die cuts and Plate P1111. Ron Blanks received a used prephosphored on-cover single today with Plate P2222. No mint copies have yet been reported. This is the first find of a plate number on the tagged Seacoast SA (Scott 3785b) reported in Linns by Ron Blanks. All previous reports were of used singles without plate numbers. Thanks to Mike Lipson for suggesting the clarification. 1/11/05 - Jim Nelson reported the first new plate number in the new year. It is the (10�) Atlas with plate combination V22111. Thanks to Jim for the scan from his used single. Gene Trinks advises that he will host a Regional PNC3 Meeting at the Plymouth Show again this year. The meeting is scheduled for Saturday, April 23rd, from 11:30 to 1 PM. It will be at the usual location, the Plymouth Central Middle School, Plymouth, Michigan. More details later. 1/1/05 - Michael Grusby questioned the listing of an upside down back number on the (25�) S/A American Eagle. There was a report of this variety when the stamp was first released but I have had no confirmed report, so the listing has been deleted.